Physical Therapy: What, I’m not magically cured after three weeks? A month ago, I got my crap together and saw a general practitioner for the first time in my adult life. “What would you like to talk about?” my doctor asked, not realizing that I would spend much of the next hour in his office either trying to talk through tears (thanks, anxiety!) or nervously laughing at every joke I tried to make. My doctor talked through my anxiety a bit and explained the prescription he’d put me on for that. We then discussed my four main sources of physical trouble (besides the now-gone gallbladder): twisted right ankle, which he did not seem concerned about; my left knee, which may have a torn meniscus, and he warned about starting surgeries on the knee because they’d likely never stop, and if my life was ok without running, why mess with it; the diagnosis of plantar fasciitis I received last summer, which garnered me a fascinating history of shoe inserts; and my left shoulder, which has been a real physical bother. For someone who hasn’t been consistently active and is relatively able-bodied, I sure am an overachiever when it comes to breaking my body. After a physical exam and feats of strength, his diagnosis was frozen shoulder. He sent me to a physical therapist and said that I could have full use of my arm back in as little as 3 weeks. I was probably more optimistic than was warranted, given the amount of time that my shoulder’s been bad and my knowledge of how muscle must be built. But it could be the case that my doctor was telling me what I wanted to hear in order to make me want to do it. In any case, it worked. Not that I advocate lying to me to get me to do things, but clearly, I’m highly motivated by both guilt and the promise of a quick reward. I went to 9 prescribed sessions before or after work over the course of 4 weeks, then scheduled another 3 sessions for evaluation and recommendation of exercises. And thank goodness for my health insurance company and their sweet low-cost copays, which I paid on each visit. Meep. My physical therapist examined me on the first day, measuring the range of motion for both arms with a protractor. I’m a living geometry demonstration! After some manipulation of the shoulder muscles, he found that he’d already been able to improve my range of motion, and he told me he didn’t think that I had frozen shoulder or that I’d torn or broken anything internally. He sent me home with two pages of exercises to do twice a day; doing these exercises usually takes about 15 minutes per session for a total of half an hour of stretching every single day. I have the discipline, but that doesn’t mean it doesn’t get old. The payoff will be worth it, I hope. I made a chart on lined notebook paper to keep track of the exercises as I do them. 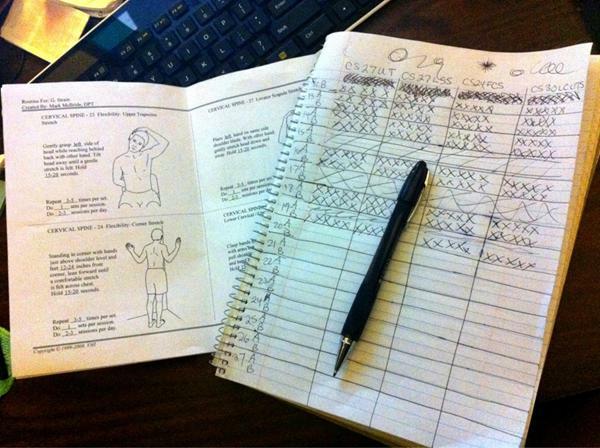 My physical therapy exercise pages and tracking notebook. At the physical therapy sessions, I do most of these stretches, plus warming up on an exercise bike that has hand pedals. I work out with resistance bands, an exercise ball, a medicine ball, and a weight machine, and I’ve been transitioned into doing push-ups against a wall. After each session, the staff leads me to the cooldown area to ice me down and do e-stim on my shoulder muscles for 15 of the most relaxing minutes of my day. My therapist says he just likes to electrocute people. He’s all right. The way they ice people down is by fitting a sleeve over the affected body part. 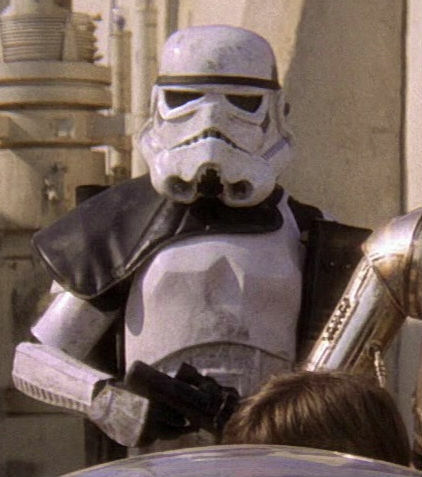 The shoulder sleeve reminds me of the shoulder…things worn by stormtroopers in Star Wars IV: A New Hope when they’re looking for the droids in Mos Eisley. Like this, but without the helmet. Blaster was usually replaced with an iPhone. The ice sessions were awesome during the ridiculous heat wave that had Dallas in a death grip for most of the summer months. My shoulder would still feel cold when I got to my house in the afternoons, and it kept me nice and cool on my drive in to work the few mornings I had to drag myself in as soon as the office opened. (As a fundamentally lazy person, it was very hard getting up so early, but that’s how I had to roll for a month’s worth of Friday mornings, for the good of my health.) I really enjoyed going to physical therapy at first, especially when I was feeling results, but the novelty has worn off, and the drive to the PT office is frequently taxing since it’s so far out of my way. In fact, I missed my second-to-last session this evening because the traffic was so heavy from downtown Dallas to the suburb where the office is located. Additionally, some of the stretches still hurt, and I now know that they’re working rather than feel significant improvement. Then again, I am doing exercises twice a day; I’m too close to the situation to see my results objectively. When my sessions are over – my last session is Friday morning, in fact – I will continue stretching, try to create an exercise routine that mimics the one my therapist has had me doing. In that spirit, I bought resistance bands (Reebok, on sale at Target for $13 bucks, not too bad) and plan to get an exercise ball. These items will live in the unused room in my house, away from the claws of my lovable but destructive pets. The place where I work has a not-terrible gym, which I will avail myself of several days a week for therapeutic purposes, as well as to finally start back up with the New Rules of Lifting for Women workout. I lifted weights with some success last year, but it is difficult, and I’m going to have to talk myself into it. I think I’ll take a week to exercise at home before I start lifting weights again; I know my body needs to keep working on building up those shoulder muscles again, but I think a short mental break will be good for me and won’t derail my long-term recovery. And I have a feeling my recover is going to be measured in months, so I need to be in the right mental state for a marathon of reasonably good discipline. I go back to my GP in two weeks. We’re going to talk about how my anxiety meds are working and how my shoulder is feeling. I have good things to report on both fronts, though I wish I could tell him my shoulder was completely better. An option he left on the table was an MRI of the shoulder area and possible surgery, if something was really wrong. No point in worrying about that until it’s time. If I need surgery, I’ll get it, take my recovery, and take my physical rehab again. If that’s the case, I hope to convince my doctor to refer me to a decent physical therapist’s office that’s a little closer either to my work or my office. I have run out of new curse words to yell at my fellow drivers when I’m trying to get to a place where I pay people for the privilege of putting me through beneficial pain. This entry was posted in health and tagged anxiety, fitness, physical therapy. Bookmark the permalink.